I’ve started getting a real sweet-tooth for wargaming mats. They make your surface just so much more desirable to play on. The immersion isn’t going to be breath-taking but it certainly is easier on the eye than playing on a battlefield comprised of oak or carpet. 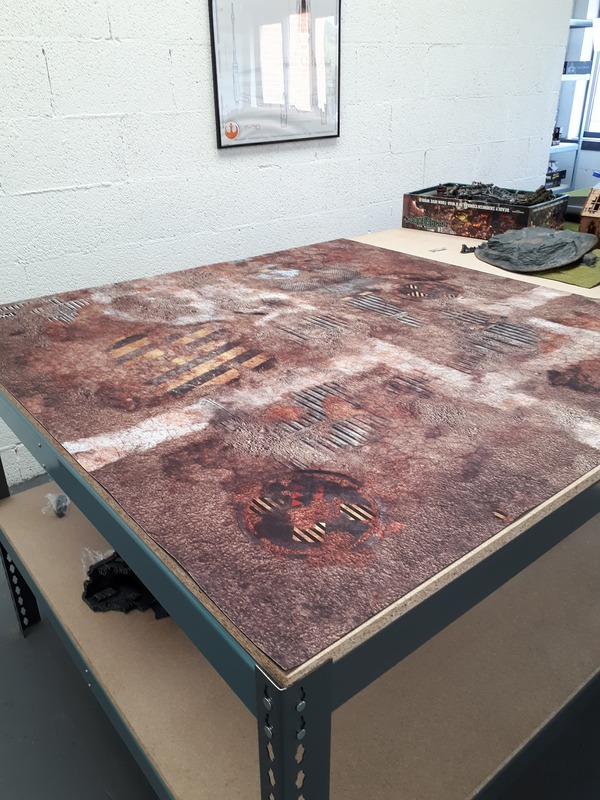 I recently got hold of the Industrial Ruins Mat from PWork Wargames. Hot off the back of my review for the Chem Zone Mat from GameMat.EU, we’ll see how this one sates my appetite for battlefields. 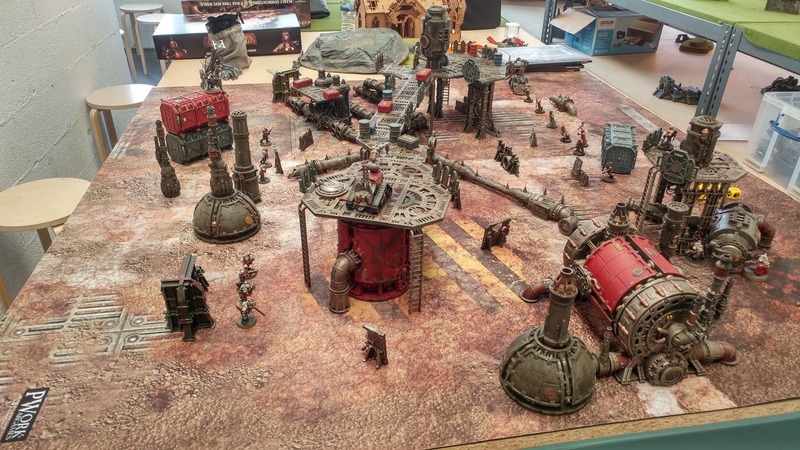 Let’s get stuck in to this PWork Wargames Industrial Ruins Mat Review! I acquired the 4ft by 4ft mousemat material version of the Industrial Ruins Mat with the intent of using it for Necromunda as well as the upcoming 40K Kill Team. I really liked the gritty, almost sporadic artwork on the mat which gave it a sense of realism. Battlefields are dirty and chaotic, not tiled and symmetrical. The hazard striping pops quite nicely with the dirt tracks helping to break up the design of the mat a bit. It’s good on the eye and when you’ve got a load of piping, walkways and cargo containers on the mat it really does look excellent. The mat feels a little thinner than I was expecting but is by no means flimsy. It grips onto flat surfaces easily and seems it could take a battering, not that you’d want it to. The lighter, sandy colour of the majority of the mat would offset dark terrain and miniatures really nicely. 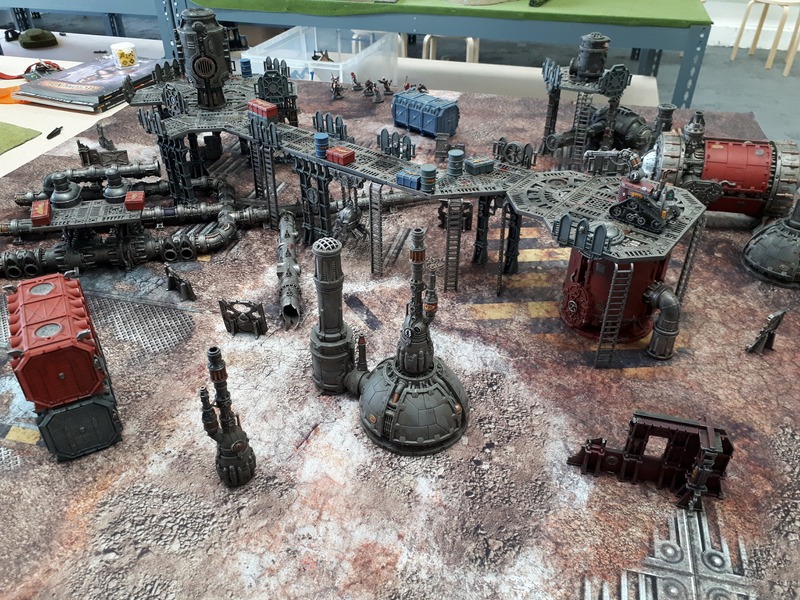 Visually, it helps to tie together most of your industrial battlefield needs and would suit Necromunda, Warhammer 40K or other sci-fi games very nicely. However, it’s not all good news with the Industrial Ruins Mat. The mat arrived rolled up in a long shipping box and survived shipping without issue but comes with no carry bag. If I’m taking this thing to game nights or clubs I’m having to throw it into the car exposed. I could always swap it out into a bag that came with one of my other mats, but it begs the question why there’s no option to even have a bag shipped with it? I’d not mind paying a little extra but as far as I can see bags simply aren’t an option. My other gripe with this mat, possibly any mats from PWork Wargames, is the logo on the product. Sure, it’s in a corner where the eye typically won’t be drawn to, but it’s quite garish. It stands out very clearly and, to me, feels very much against the aims of having a mat like this in the first place. Deep Cut Studio mats have their logo on, but it’s at least a little harder to pick out. PWork Wargames have branded their mats with a hard-to-miss logo in an attempt to self-promote in clubs and events. It makes a little sense but to the end consumer like myself it just feels like a blemish. Especially since you can’t see it in the product images on their store, this feels a bit underhanded to me. The print quality and sturdiness of the mat cannot be questioned, for the most part it ticks all the metaphorical boxes you’d need. Once you’ve got models and scenery all over the mat it absolutely serves the purpose. Thus far mats I have bought either come with an attractive product box to carry it in or with a handy carry bag with this one being the exception. Hauling this thing to and from places isn’t the end of the world, but it would certainly aid the life span of the mat. This coupled with the PWork Wargames logo in the corner of the mat stop it from quite reaching the benchmark that other mats have set for me. The price is semi-reasonable at €54.90 but you can get a similar 4ft x 4ft mat from another company such as GameMat.EU and that even includes the bag and no obnoxious logo for a similar price. 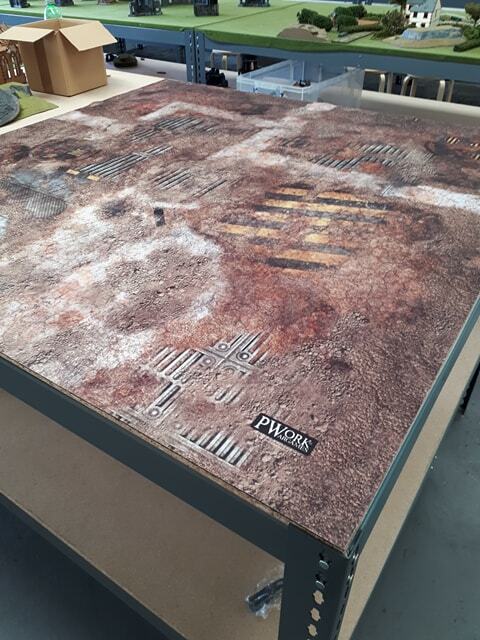 The PWork Wargames Industrial Ruins Mat absolutely does the job you need it to as an attractive and durable game mat. However, it’s worth pointing out that you can technically get better bang for your buck elsewhere. For more reviews, news and updates on everything tabletop and wargaming, stick with us at TabletopGamesUK. Don’t forget to follow our Facebook regularly for updates, too!